The Contradictions of my life include.. I had to look up the meaning of contradiction lol. I definitely love the meaning and it really does sum up the continuing story of my life. 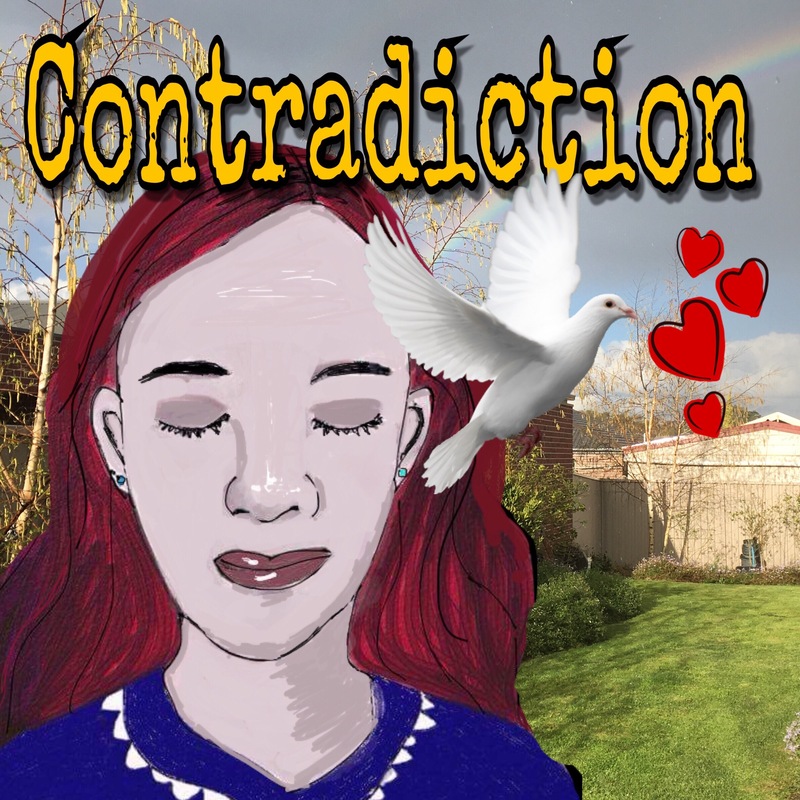 One of the major contradictions has been my religion and how I live and express my faith. If you were to scroll through my face book feed for example you might have a hard time pinning down my exact beliefs. In fact it might not show outwardly that I am much of a Jesus girl at all but anyone who truly knows me knows my heart. I have gone a different path from the outward signs and believe it or not it has not been easy. But I am getting freer. All my life basically I have spoken, read, acted a certain way. Christian way. It is hard after 40 years to divert I can tell you. I have not thrown the baby out with the bath water at all though it may look like it. This path I have taken has unfortunately appeared to separate me from the main flock though. But like deafness which did the same this experience has changed me and helped me learn much more about God and myself than I knew and thought was possible. I know my boundaries very well but because people and distractions have been minimal Gods presence is more evident to me and I know within myself what is of me and what is not. A living between worlds you might call it. What I always thought I knew opposed to what I am knowing and learning now because any type of survival living increases your knowledge. Truth is beautiful and it has been a huge step out of my comfort zone. Finding God via HIS Spirit with me in the here and now and that HE is always present and that I don’t need props to experience spiritual life gives me so much space but that has also meant separation from people which has been peculiar I can tell you. Still getting used to that. The thing is it’s what you find on the edges and beyond that is so fascinating and not at all what you thought it once was. Of course it is hard, very very hard to go against the grain and live differently. The guilt oh my. The disconnection and I am deaf too so I’d honestly say it destroys you and builds you into a whole new person cause it makes for a very hard, dark, cold and lonely world when people turn their backs and nothing remains the same. You either return tail down defeated, shrivel up and die or find a whole new way to live. Spirit and Art has been my way through. I truly meet Gods Spirit in this whole process. Like a steady bubbling river always flowing and the awareness of even the smallest of details around you seem to line up and everything has deeper meaning and purpose but it appears to come at a cost you disappear off the radar. No longer can you live via external appearance and behaviour. It has to be an inside job. It forces you to actually think about what you believe and why you believe the way you do every single day. You are not just relying on what you are doing or what you are saying or what you have always done. You are actually thinking and in the moment every moment not just going into auto-pilot. Believe me when you are in midst the majority a lot of it is simply talking, doing and living like everyone else because that’s what you’ve been taught and you don’t realize it but every time someone affirms you who believes the same it keeps you in line. You will want to stay away from anyone outside that and that should be a warning sign because God is everywhere. We are all His children, people just do not know & realise the whole truth. If everyone else around you is the same. It’s easy/easier to be that way especially if you only associate with similar minded people. Stop in any way doing or being like everyone else or being around people like that and suddenly you are faced with a dilemma you start to be challenged on all sides. I have been careful not to just throw everything away. I especially want to be real not fake. Such as.. if you say I am feeling fine when actually you are not. I want what I believe to radiate out of me because it’s who I am within my heart rather than outward words or actions. Being deaf has taught me the value of looking into someone’s eyes/face, reading body language, the power of touch and just how an acknowledgment no matter how small when you can understand can change the direction of a day. I don’t want to force what I believe on someone or expect them to do what I do because its right or wrong. I especially love a quote by Rumi. I want anyone to be truly comfortable being themselves in my presence as I believe God wants us to feel in His presence. Same as in this quote. I think of nature and how we don’t go out into nature and argue with it as to how the trees are planted, how the flowers grow or the sun is shining or not. We just enjoy it for what it is. To show our enjoyment we might take off our shoes and walk in the grass if it’s a nice day. Or we stand somewhere safe and watch the thunder storm or we look in awe at a mountain peak or even climb it. We spend hours walking along a sandy beach with water lapping at our toes. We gaze up in wonder as the stars come out at night. If only we could be in each others presence and just enjoy it the same. Just as we are without trappings, expecting someone to change or trying to find fault. I feel religion is like a competition and I am always a loser. I know it is supposed to be ALL about God.. But do this or do that or don’t do this or that. Its all comparative. Least on my own with God I can totally be myself. I don’t have to put on airs and graces. He sees and knows all that other crazy stuff anyway and I can just enjoy HIM and HE me and its natural. I speak like myself and I can sing loud or crazy or cry or laugh or moan. I can just thank HIM or pray for people or my world. I also do not feel guilty because I failed in some way or another cause I know HE loves me and HE did it all perfect anyway so I don’t ever have to ever feel a failure so I can drop the ever present need to better myself.. In religious settings you cannot easily be yourself there are trappings and ways to do or not do things.. You can admit sin and all but you have to deny yourself and although I am not against change perse or focusing on God. I think those things will happen and should happen naturally and I think also when you know HIM in a real way and you know HIS love for you.. you just do different when you learn the truth and it goes down into all those difficult hurt places and you do not feel the need to pretend, put on a mask or perform..
Art-wise being spiritually expressive I am not forced, not stunted, I am free, not doing it because everyone else is doing it and I can enjoy it or even when I might be suffering in my soul I don’t know but you are dealing with it in a way that naturally heals and helps you through the release of it where your not being held accountable by people or clergy, shame, fear or judgment and its flowing out freely by choice not because you have too. It is pure Spirit. I hear God say he is looking for true worshipers who will worship in spirit and truth. Authentically and with a whole heart I can say this is my aim. It is another world really yet it is found within my skin and flesh. Kingdom of God is within. So why should I be trying so hard on the outside when the most important is all within? I especially want to voyage to.. JOURNEY: 30 Day Journal Project that’s taken months lol but not giving up. Prompt — I especially want to voyage to.. Some people travel the world I may never get to do that. But every day I have access to me. So many things in my life including people have tried to shut me down. The person who I am. My prerogative is to live out loud and at the very least enjoy my life and let that joy be released somewhere. All the better if it helps someone else!! I enjoy seeing the world though but it can make the four walls around me seem to be closing in mighty tight especially when you think outwardly too much about it and wish yourself away but you cannot go there in person. When I was thinking about this prompt I mean obviously there are many places in the world I would love to see. I grew up learning about the bible and the stories in it and I actually would love to travel to the Holy land and see those places for real.. I am best friends with a Canadian on line so obviously as I have talked to him all about his life and where he lives I have grown an interest in his part of the world that would be fascinating to see in person especially cause it would mean meeting him too. But honestly thinking too much about what I cannot do is quite self defeating. So my mind was whirring as I contemplated this prompt and suddenly a song popped into my head. The song with lyrics “I’ve been to paradise but I’ve never been to me..” Vivian Chow is the artist and Ron Miller the composer. I have not been all over the world in fact I have never traveled out of Australia except to Tasmania lol which is an island state but daily I can visit and trip to ‘me’ and lack of money cannot bar me from this journey.. The imagination alone of one human being can change a world. Look at artists and authors whose imagination has brought much joy through the ages!! Dr Suess, Ronald Dahl, J. K Rowling, J. R. R. Tolkien, Frida Kahlo, Vincent Van Gogh, Claude Monet.. Andy Warhol.. to name a few.. So I shouldn’t be so afraid of being in my own little world. You can never be bored if you open up your mind, use what you have at hand and introverts can really be at home with themselves and enjoy their own life much more than extroverts could.. If you can be happy on your own and find your own amusement right where you are it makes the hard times extremely bearable and you can still have a full life. Paint your world red or blue or green or multi-colored and change it every day if that’s what you wish. 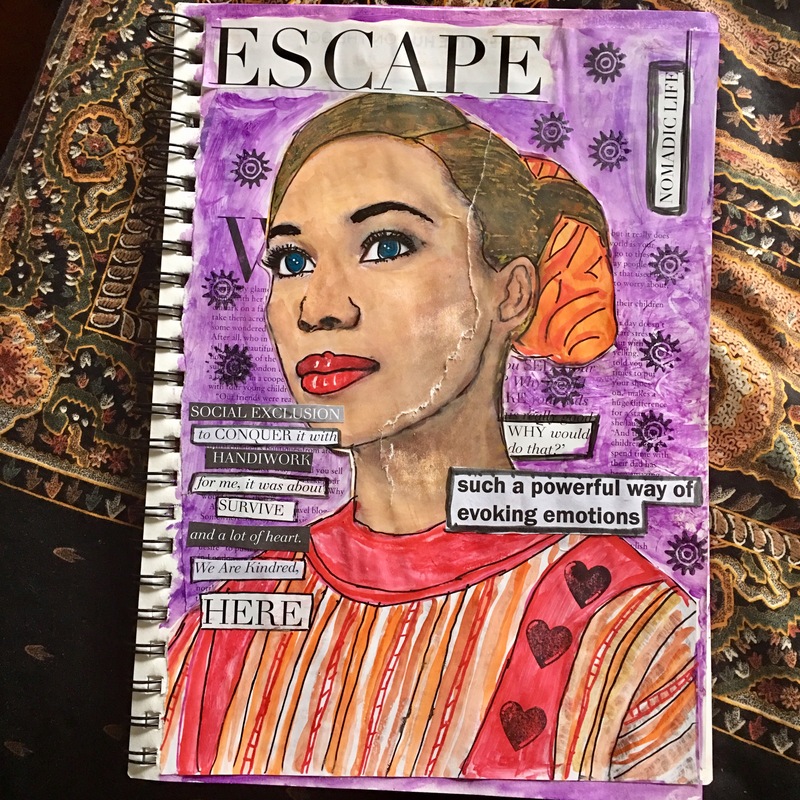 Obviously art journaling, prompts, blogging etc all these are ways to explore myself and my faith and life. If I can keep doing it daily it truly helps me stay positive, happy and stops me shutting down. Cause we all know life can be hard and a daily slog and when not much changes around you, not much money etc you can pine away and lose hope.. Creativity keeps the inner world alive and kicking and imagination can take you places that are fun, challenging, deep or shallow and do not depend of others being there or not. 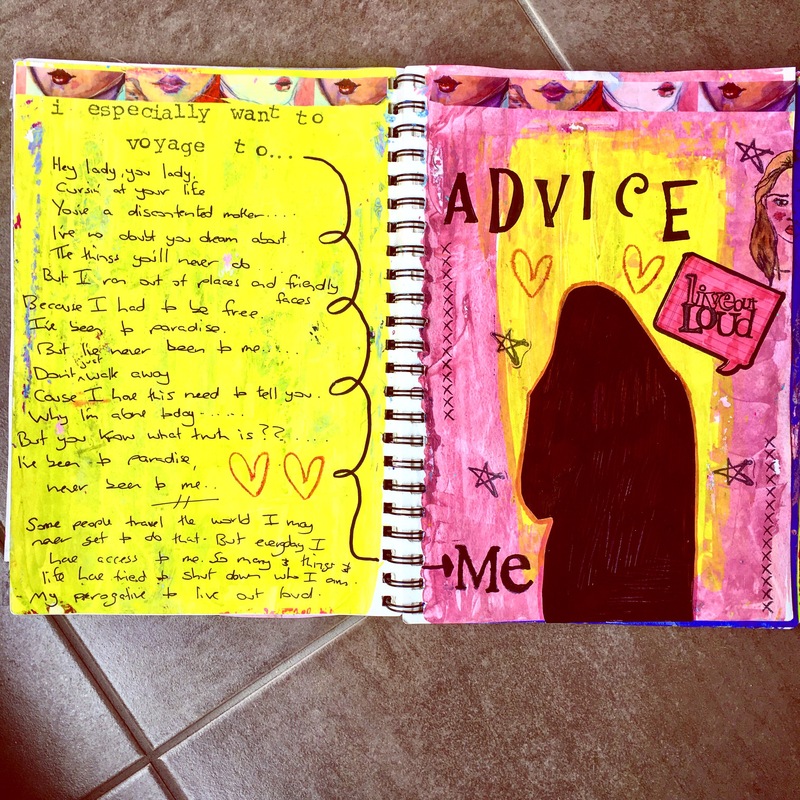 That song I quoted before many of the lyrics resonated with me so I added them to my art journal page. It’s interesting as I look at the pages which I did a while ago now. That although the black figure which represents me seems boring it is surrounded by very bright colors!!! I can see in my art I am depicting that I am not found where naturally one would think I should be.. I live on in my art and I don’t know whether other people do see that or not. I do not get a lot of responses and although I am not really very social at all I think my art is me being extremely social!!! My art continues to go out into the world so people can find me if they really want too and I hope get to know me better this way. The key word for this days journey is Advice and mine is ‘Live out Loud’ which just seems so appropriate and what my life has been all about as I am said to be a quiet, introverted person yet bright yellow in the background really does scream something quite different doesn’t it. Deaf people are often muted in the world simply because we cannot communicate in the normal way so we can be easily forgotten and left out. One important way to live fully functioning for a deaf person is through expressive sign language which I don’t think anyone can help noticing!! It’s very visual and many hearing people nowadays enjoy learning it.. A whole new path to communicate. Art has been my path and it so beautiful and I am very thankful to God for it. Loud is expressed in the colors that I use. Loud is speaking my truth and sharing my spirit/heart publicly often even when it appears no one is listening. 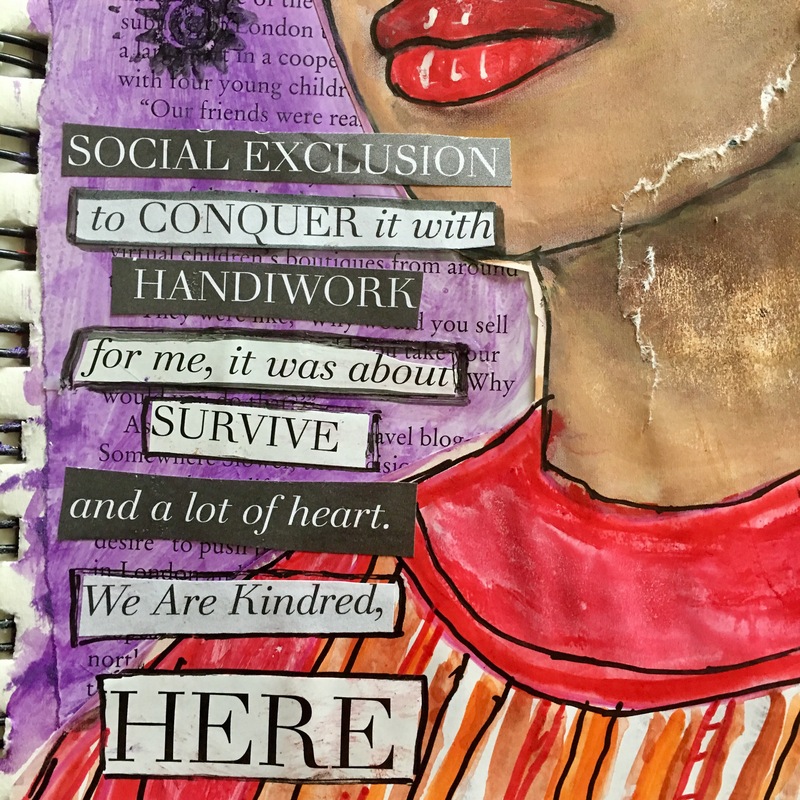 Sharing my blog which is my thoughts etc into the world via social media IS being loud. It all says something about who I am and what my message is to the world and sometimes I am amazed just what I am expressing and how easy it is to do when in the natural I feel quite tightly bound and muted. I cannot physically put myself out into the world like I wish I could but here oh wow I am as free as a bird. So where I am missing in this world.. you can still find me.. right here is where I am and what I share is what I feel and think and see. So where I cannot travel in a physical sense with words or in person or to different places because I do not have the money or availability to do so. I can travel through myself via the creative expressions I use. This lyric from the above mentioned song say it perfectly. Because I had to be free. I wish I could communicate like everyone else. I often get tongue-tied even when I am with people and that’s without throwing in deafness. Every day conversations aren’t deep enough either and I go away frustrated that I didn’t say or ask others the things I really wanted to say. I turn off easily and that’s not the fault of people I’m with it’s just I crave deep soul connection and it’s tiring having to try to hear and understand even half of what’s said and find a way to dig deep as well. I also like to chatter on about everything too but that’s hard to do when few are around and there are barriers. Somehow when I create.. everything i miss and all that’s unsaid inside me doesn’t need to be said. Somehow it’s absorbed into what I’m doing and where my art takes me and it’s enough.. I don’t have to go anywhere and yet I feel fully alive and happy. As if I’ve travelled all over the globe and sailed the widest ocean. When I create and express myself I’m not disabled and I can go as deep as I need. It doesn’t have to sound right, it can be loud or soft, bright or dull. Angry or sad and I’m not restricted. Yet it still says what I need to say. Things fit together in this world. I don’t have to explain myself here. I don’t have to miss out..
Why I love what I do is when I started looking for cut outs from magazines for this page. With the word prompt “Escape” in my head I found the word almost straight away. As if this very page was exactly what I was meant to do today. It was waiting for me.. My life seems fitted for creativity and I run here more often than not. I see it as God going before.. meeting me here. I’m welcome. I’m free. I’m happy. I’m contributing. I find the connection I need to live the life I live. Meaningful & with purpose. I can let my emotions sparkle & shine. I can share my heart & soul and enjoy doing it. Where I can be fully me and speak my truths. Live a full life within this skin and the circumstances I’m born into. Where joy springs from within no matter how many emotions I might have felt up to this point. I belong and gracefully even my imperfections are perfectly at home in this place.. Prompt — I feel I belong..
Belonging is so very important. It’s a life force which flows from one to the other probably when you are a people person you can take it for granted. But when you fall through the cracks of life you can yearn for it and realize it’s value and see its goodness and purpose much better because it is something you do not feel you have. I think of it like electricity poles without wires. The interactions we make with each other fire us up every day. It is why when a stranger smiles at you it makes you feel really good inside. I am energized by creative people. Whether I am in their company or not. Their art or expressions just seem to have a life of its own or a part of the person’s spirit resides in their creativity and transmits to the one who admires it. I feel I belong in such company. It is hard to explain. But although creative people appear to be different sorts of people. They are warm and welcoming in ways that are beyond the physical. You feel drawn to them but also strangely connected. In their midst you are much happier. You do belong and I guess maybe you feel like you know them better then you actually do. Old souls or something. I don’t need them to be constantly in my life because they kinda already are. They have affected a part of me inside. Inspired me and their art keeps me going, gives me hope, draws out of me what I cannot get out of myself on my own. They seem to accept you as you are and you them. There can be similarities to our journeys even though we may be on completely different sides of the earth, believe totally different things and even have different centuries of birth. That one I touched on last blog post. I know people feed off each other. I cannot speak from an extroverts position. I am a loner. But it doesn’t mean I don’t wish to belong I really really do. I just flow differently that’s all. I still need to meet and mingle with fish in my stream. I guess it makes me daily search to find it. I do it all of course from the internet. Ha. My bedroom. Spirit is found on-line and I love that our modern world has this option. It is strange though. Years ago you would be completely isolated if there were no people around you and even mailing hand written letters would take months to arrive. We do take the written word so much for granted these days. We get annoyed if our texts are not answered straight away!!! I never know where my writing is going to flow when I do it. Being a single woman who is a romantic at heart flying solo I loathe it but yes I do have lots of time to do art and nobody is going to care if art supplies are flung across my bed. 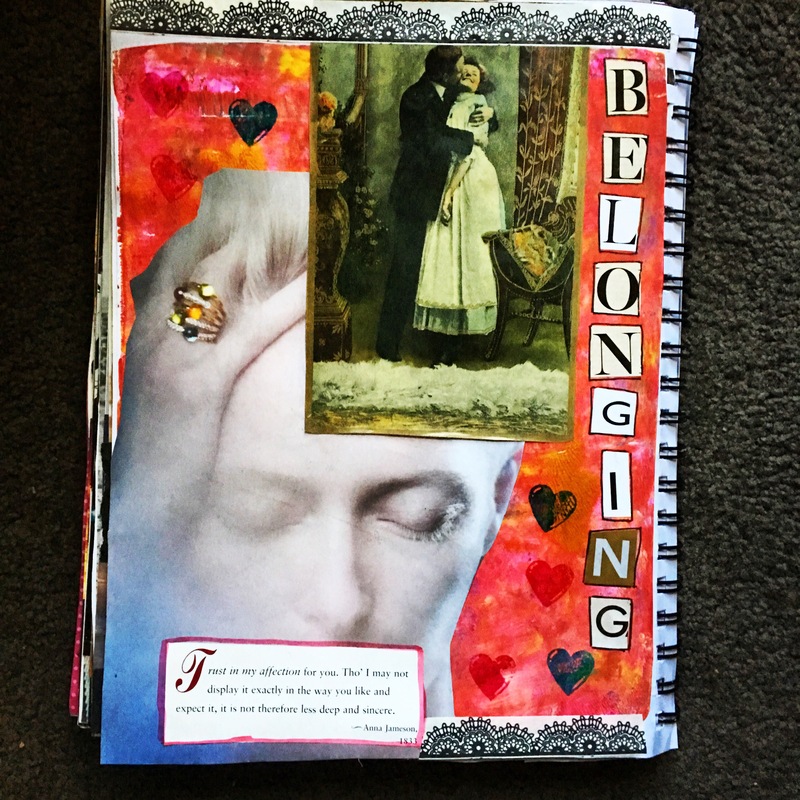 So I am going to base my art journal page along with this writing on my hearts desire that is to be loved and passionately because that is a belonging I crave. Now I KNOW spiritually GOD loves me more than any human man or woman could ever love me. I do not physically see HIM or feel HIM that way. I found a beautiful book at an op shop yesterday (thrift store) about quotes and pics of love. Now that IS exactly how my wildly romantic heart has to function these days. I have to stubbornly believe it without seeing or physically feeling it. NOW I can feel it if I take these words into my heart and see with spiritual eyes that GOD is speaking and loving me. Faith is a powerful ally. Children hear Santa on the roof. Authors imagine whole other worlds without actually seeing them with their eyes. Imagination is a great gift. God has shown me there is great joy in HIS presence. The bible says that too but I have also felt this said joy despite my life and situation. A joy flood over me in my room or wherever I am aware of HIM but not the bible HIM I was taught since childhood only the personal HIM I found on my own.. It is supernatural. I mean it is not of me at that moment. I truly believe as I have trusted GOD. Yet that word GOD is not enough.. Jesus, Yeshua much closer to explaining HIM who is dear to me. I do not know what word actually would come close to explaining how I really feel about HIM. HE is a real presence to me and why I always capitalize the words to honor HIM. I know in text speak it symbolizes shouting. But to me capitalizing his name I am revering the presence and how real and big and beautiful HE is to me. A realm of understanding where I belong more than ANY place on earth and am affectionately known and beloved MORE than any human on earth. I can literally be pulled by a desire to speak to HIM that is I guess likened to when you wish to stalk a certain person or be close to someone you desire or only just to hear them say your name. Except that it isn’t a figure I can talk to face to face. Hand on my heart. Hands raised. What I call real worship. Because it isn’t forced and it springs from within and its not only on Sunday. It can be anywhere and anyplace. Personal. I mean I can speak as I am. Awkward. Spazzy. Too many words that spill out all at once that not anyone wishes to hear at anytime but HE does. Spontaneous. For the most I’d say private too. Not that I am ashamed. But I get excited and because I am deaf I speak loud and people shush me always. GOD doesn’t seem to mind. 🙂 But I will anywhere and with anyone also in the moment. What has surprised me most of all. That I was never taught in church. Is just HOW MUCH HE loves me. In church it’s all focus totally on GOD and the rituals and presentation of it is sort of to be as perfect as you can be. Doesn’t bide well for a clumsy, loud and often late to church person. But I don’t know it seemed to be to the detriment of the value of ones messy soul. Perhaps in recent years when I have not been in the building of a Sunday things are changing. But I had to leave the building to find the whole truth and I am still learning. My life is not what you would call overly religious by the standard I once adhered too. I suppose reading this you would think I was still there lol. But I am in pjs and it’s almost midday as I write. I do not go to a building and haven’t for years. I do not deliberately daily read the bible though I quote from it. Nor have hour long prayer times set aside. I just live aware of HIM. HE is more like the air I breathe every day. Like the quote says. I live my life trusting in HIM rather then a set of rules and regulations that I adhere too strictly. I can see that many things HE said are helpful and important. And I have not thrown the baby out with the bath water. I live from within rather than from without. Spirit and truth rather than a wider based term of ‘Christianity’.. I belong because of HIM and what HE did and because of who HE is and who that makes me. Yet I am fully me as I am through HIM. True freedom. I found myself totally an utterly transformed when aware of HIS realm. Takes faith yes. Strong focus because we want what we want and sometimes it doesn’t come the way we wish for it in the physical but also our old ways do not work here so to belong we need to think different. It also takes a stubbornness. A stubbornness to not give up but live as if I was in this realm every single moment of every single day. It has taken a strong heart too because you know dropping out of ‘church’ suddenly you are very much on your own. Oh I know I belong despite how people think I am, judge me to be or how many still believe I have fallen away. But you have to live in this world side by side and they so far for the most who live religiously give me the cold shoulder. See me as out of the fold rather than in. That isn’t so easy to imagine away. Also it is realizing that many are still not aware that spirit is different to flesh living and that is perhaps why they cannot yet see what I see and live as I live but I’m sharing it regularly and not hiding. For quite some time it’s felt I am in a different world to most everyone else.. Prompt : What propels me forward.. I am propelled forward by the content I come across in life and as always it fits. Doesn’t matter when I look for it. What time of day or state of mind I am in. It all fits. This is exactly what keeps me going forward. Lord have mercy. When there is nothing in the tank but still I can drive ha ha. What is that?? A miracle. IT IS HIS strength in my weakness.. is what it is. No doubt about that. It is an inward journey I am on or voyage. Sailing the sea of the Kingdom of God. My Spirit alive and free. While my body sadly lags. My flesh gave up many moons ago. True that. Today the magazine cover floors me. It is a magazine I rarely read that comes in the mail because I am in a roadside assist for my car. Magazine comes with the deal. I cut pictures out of it that is about it. But today the cover oh my oh my. THIS is what propels me forward. That a Lion is a representation of GOD. Look at the title. Woah.. In the KING’S DOMAIN. Couldn’t be anymore accurate!! I have basically failed in the human domain. Mmm and I am not ashamed to say that. But IN HIS domain well it’s a whole different ball game. The Kingdom of God is within. So my introversion serves me well. My daily voyages are in-wards. Art picture fits. I copied or drew it based on another artists pic. Nothing like the original except the figure is based on it. No worries about copyright lol. I just liked the closed eyes and the hand on her heart. It’s a representation of myself and my inner voyage. The arrows are outward pressures. I have felt them about as strongly as I ever have of late. I don’t always fair well with the voyage. It can be choppy seas and I spend most of it holding the edge of the ship and hanging on for dear life. But when I do cry out to God and look for HIM HE is always with me. Last night he was speaking to me in my dreams. It felt like I was not sleeping much. But today I am no more tired than other days so I don’t know what exactly it was. He seemed to have much to say. Traditional type prayers have kind of let me down. I don’t know it’s very hard to know what to pray for when you don’t see much change in your life. Our oldest daughter has had what looks like a relapse of earlier illness that knocked her around as a teenager. It’s a knife in your heart when a child suffers. You suffer along with them as a parent. You may not feel the pain they do but you feel a different kind of suffering alongside of them. Our daughter has worked so hard to get through university, finally is qualified and doing nicely and illness strikes. It seems so unfair. The other night I cried out with what felt like virtually no faith at all. I have never been in that place before. I have always had some faith. Small though it may be but never what felt faithless. I was crying and just saying GOD I don’t believe help my unbelief. I guess even when you feel you have none I was aware and still crying to God. But it felt so absolutely empty my faith gauge. Like I didn’t even want to because nothing much happens in that prayer realm but I still need help and my daughter needs help. So Damn it I am here crying because I have nowhere else to turn. I know HE is there and I do not doubt that. I know HIM very closely because there isn’t really even a person I can talk too about deep things anymore. Not in a way I feel I need too. I am glad HE is there I was just very physically low that night and stretched thin. Strange times. I know others go through it too in their own way. One thing that amazed me as I cried out was what I said. Over and over. Now I am single and a loner and my heart cry wasn’t for a man or friend. Though I did also cry out for someone just one other person who gets me and I can share my heart and this crazy loneliness with. But my main cry was to see!?! Just has felt very dark for quite some time. No breakthroughs. No changes. I have had no energy for much at all. Nothing that I could say has happened that I could put my finger on. This is helping me or that is helping me or this person is close and I can go to them. Has been no one. Not the way I need. I want to see something more for all the darkness. I know I have not been alone in it. I know it all has helped me know peace and joy and spiritual strength like nothing else on earth could bring me. That is there that has not alluded me. It is just this darkness and void that I walk through daily that seems never ending. It is a most unpleasant place. To see the Lion. 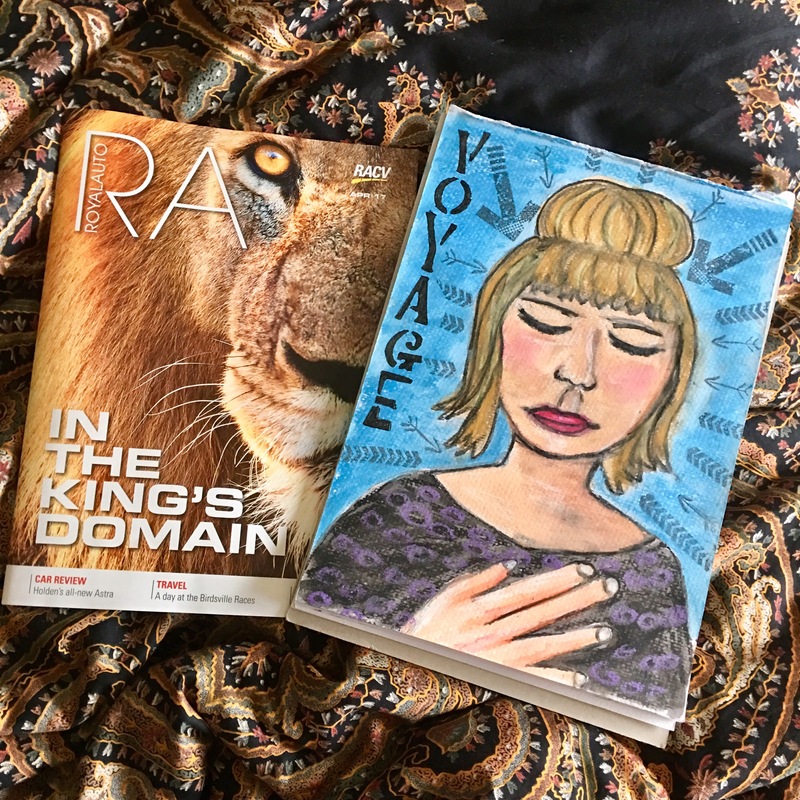 To read “In the King’s domain.” To talk here and now about a voyage. To talk about what propels me forward. Is this. That I desperately need to see GOD for HE alone is the only one who knows and can comfort me right now in this place. HE who can make HIS presence known even using a secular magazine. It is incredibly comforting I just suppose I need to avail of HIM more then ever before. It may not mean anything to anyone else but to me it is the “seeing” I need and I have cried out for. I must believe I am indeed in HIS realm. That HE is taking care of me and I can let go of all that outwardly isn’t making sense and seems to be obliterating me from the outside. At the end of this writing I will show you what I am seeing and have seen in the past. I really truly hope sharing my own personal low and high moments. Anyone else struggling will start seeing GOD in their own lives in whatever way HE shows up and that your spirit sees more clearly than ever before. No I cannot unfortunately save you from the physical world or give you anything in that realm but I can show you that GOD has not abandoned you therefore somehow someway there is something greater happening and inwardly we can be revived and I believe we will walk through it eventually. 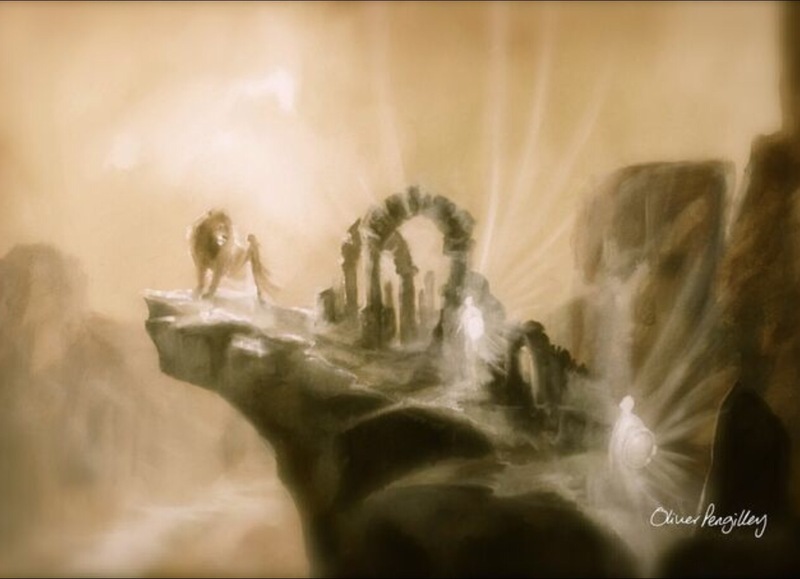 ++ The art of the Lion I came across over 3 years ago and it so so so encourages me in my life journey and it helps me for where I am and how I am.. you should be able to see it still links in and is extremely relevant.. I paid the artist money to download it, keep and use it. In order to go anywhere I have to do the work daily without human support, without human guidance & without any idea where I’m headed. Spirit the key. Fear has stopped me. Fear that I’m irrelevant. Fear that there is no purpose in it. Meanderings of a fool kind of thing. I can’t change so many many things but I can do my art daily. I know things happen in this realm that do not happen in any other.. powerful things.. I sense great workings there. It’s just for some strange reason it’s not affecting anyone else. No one else I know seems aware of it.. drives me balmy lol and means I have little desire to be social much at all.. I only get minute inklings that it’s for any other reason than to keep me alive and kicking..
My art isn’t sold, sought after or my writing attract attention.. purely seems to be for myself. I don’t even have a daily burning inside for certain things.. anything for that matter.. my physical self would just sit and waste time.. stand back from life and watch others live it. Spirit on the other hand is hungry for beauty, deeper meaning and connections and seems to thrive on expressing self. It is empowered by authentic sharing of any kind. Constantly seeking for encounters with such.. I don’t allow myself to soak in it enough.. I need to be mindful. Listen to the Spirit. He does speak often. I’m am greatly aware of Gods presence because humans stay away.. if not for my children I may as well become a type of monk.. I suppose when my mind is not focused I’m lost, directionless, a drifter, not productive.. definitely not seeing the signs or reading them.. Direction to me right now is anytime I’m concentrating.. aware.. not being brought down to earth by lack of people around me, honing in on Spirit.. not being afraid of weaknesses that rob me.. But allowing my own senses to run a different race.. God with me.. I need to drop guilt.. drop feelings of inadequacy.. drop a sense of lostness.. Allow the Spirit of God to free me from human conventions.. jump the borders of what dwelling on anything that keeps me bound to old paths.. Run with it..
Just now I’ve sat in this flow and it comes easy..
As opposed to hours fussing over what I should do with my time today.. all the guessing, wishing, thinking, annoyances with myself for not having any ideas produced nothing.. I guess no perceived ideas at all isn’t the ideal place to start from.. But realising I have began a 30 day journal project and that I’m 19 days in and it is something I have enjoyed doing I’m going to go with that. And so it flows.. If my life is my art, then… Here I am. Took me about 24 hours to do so. I have been participating in a free Mental health and literature university course so what I have been learning has influenced the way I wrote it. 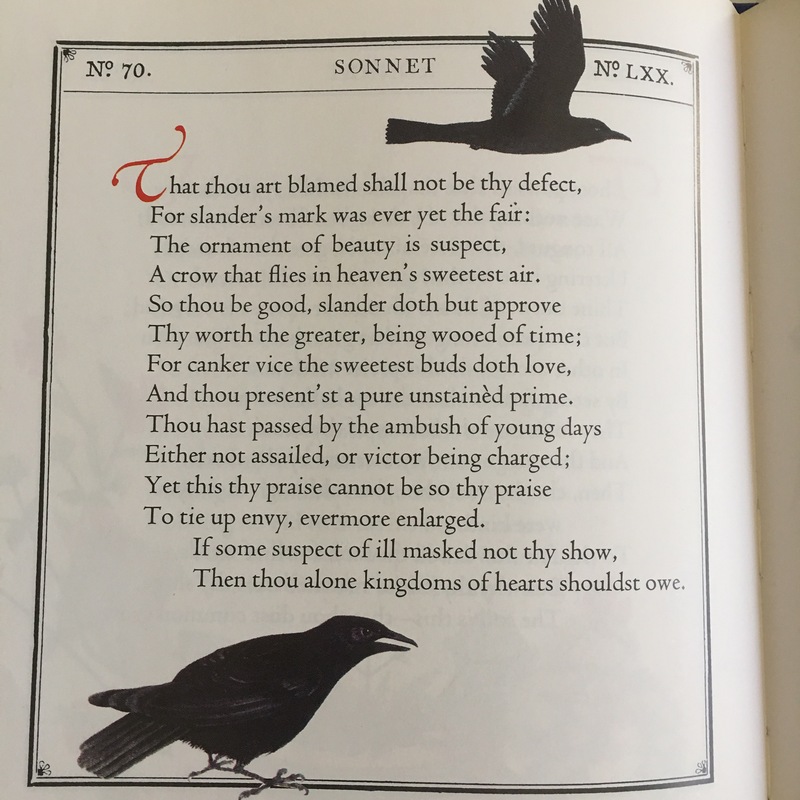 Using a rhyming parameter within the poem because I like the challenge of fitting in the content of what I want to say to a sort of guideline. I haven’t let myself get too pedantic with it because I am still learning to write but I worked with it quite a while to make it sound more the way I wanted it too and feel proud of myself I had a go. I really don’t know what to name it lol. so atm the poem has not got a title. 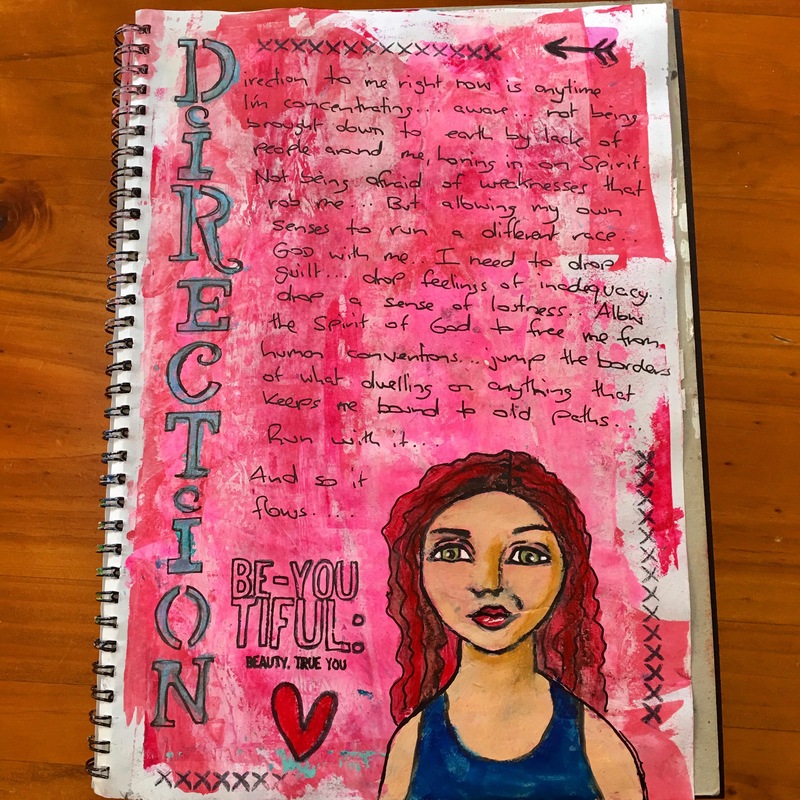 The art journaling quote is actually adapted from a talk by Stephen Fry when he spoke on a video lesson from said University course above. Resonated with me. I used my own writing to show it has personal meaning to me. I think my art is too simple but yet the spirit in me is NOT simple and I have to get over the fear that my physical life (deafness, shyness, introversion, simplicity and lack of social skills) doesn’t restrict my spirit. I can connect to others despite myself and still make my way in the world. With this whole days prompt I have tried to describe what art means to me, how it helps me, why I do it and why it is SO important. I really am learning to define myself better and can you believe it. Use less words lol. I tend to over explain everything though. Poetry is good for condensing what you want to say. I am trying not to be too religious rather I want that to be seen in my heart and expressions, not just because of my language and outward appearance. But it is hard not to be. I have been religious almost all my life. So its a challenge not to put God in there as I think people want Him to be in there or even how I think HE should be in there. I want to try new things. God is always my source so I want my heart to flow from that naturally. I am rather tired of the religious trappings and it tends to stifle me too. I have learnt to bypass the way most people communicate because of deafness and I think yes unlike the parameters in my poem. I want to be anti boxed in with my spirit. I want my soul/spirit/expressions to be real and authentic and find a connection not just with religious people but all people. Everyone has a spirit. God is everywhere and HE can speak to people in many ways and I try to push the boundaries of how I express my faith. Not just a heart expressed. Courage.. I am drawn to explore.. Unknown. I wrote this out a few days ago, sat down to finish it yesterday and the lap top froze. Lol I took a picture of the screen but only managed to take a pic of half of my writing the rest I lost. So frustrating. One thing after another atm going wrong. My Tv stopped working. My lap top having problems and today I dropped my phone quite hard and now noticed the screen is cracked. I have had phones for years and never cracked my screen. It is very frustrating cause I am not in a great financial situation and when things break it means often I cannot replace. Thankfully my TV is still under warranty. So that will be able to be either fixed or replaced. I struggle to write on a normal day but make myself persist and then losing it sigh I am tempted to give up this one altogether but will struggle on and get it out. I will also remember to keep hitting save regularly. I don’t think I did actually save the writing. I worked on it through the day and Scrivener just re-opened my writing where I was up too whenever I came back to it? I did not seem to have a backup copy even though the computer remembered each time? 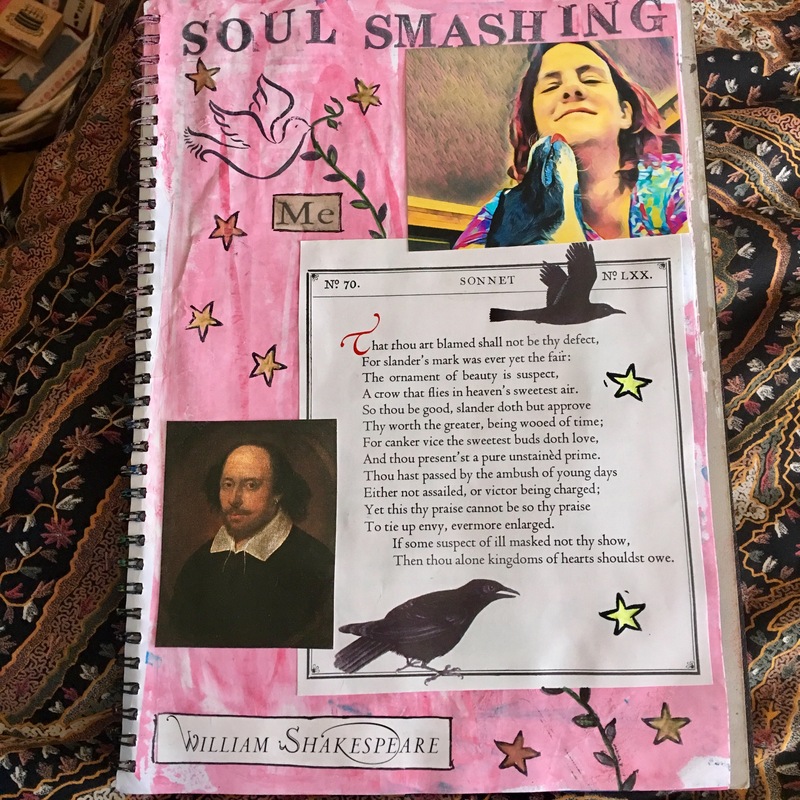 The poem I wrote out on the art journaling picture below was found through the Mental Health and Literature course I am doing online at Future Learn University which is a free course. 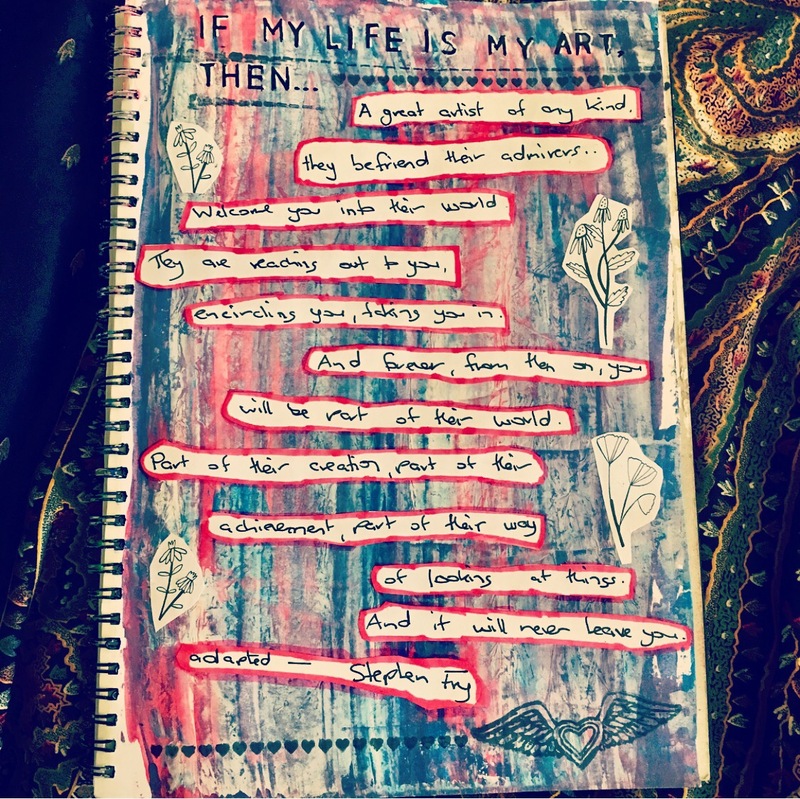 I will add a link to the poem below for anyone who wishes to read it because my writing in my art is atrocious. I am so loving this course. Has really opened up poetry to me and when I saw and read this poem. Man lol it really just mirrored what I have felt about my path with God. I printed it out and pasted a copy in my diary as well. I combined it with an angel in my art.. Because I found a box of oracle cards for two dollars in an op shop. I love packs of cards especially the bigger kind I can use them for inspiration cards but this pack has the most beautiful art. I found out about using oracle cards through Leonie Dawson. You shuffle, can pray over them, speak questions you want answered to the universe and choose cards using them to guide your life, day etc. Now I know some Christians would have nothing to do with such. I don’t pick cards to guide me rather say if I picked a card and the current one said ‘Guardian Angel’ I use that as a theme to further explore that topic for my day or days. I look for scriptures, pics etc even do a google search for writings on angels. This writing right now is influenced by the “Guardian Angel” card which is what came up for me. I have been asking God as a result that angels guide me to help me on my journey in life and creatively. With the oracle cards there is a booklet with a write up for every card. I have a look at it but I pray to God firstly, let the Holy Spirit lead me and also see where my creative spirit takes me. 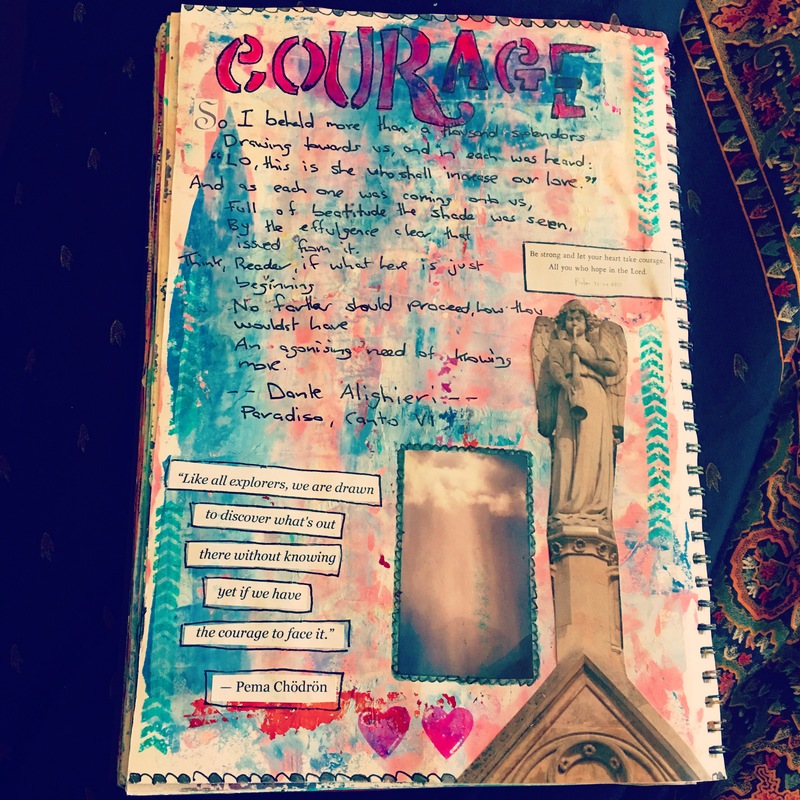 It is amazing how bible verses pop into my head as I put this page and writing together based on today’s prompt (Courage) and the word Angel it’s really a very spiritual time. I am very encouraged through it. I can see it all fits, despite timing, things that go wrong, the way I am lol, the different method I’ve used and it so helps me keep at it, this thing called life. It is quite exciting. Spirit is never contained. It is always timely. Such a freedom in the way you can express it and enjoy it. I see Spirit embraces & connects all of life and the forms it takes. I am a simple person but I do need guidance. People confuse me. People have their own agendas. I am different to most. I said to God in prayer recently. I am a square peg I cannot fit in a round hole no matter how much people try to peg me in. I don’t want to either. I trust God. I believe this path has been about learning to trust in the dark when I cannot see the light around me but I think also it has been about forging new paths and seeing the light within me does direct my path. I have had to stubbornly believe despite my circumstances. It has been imperative to have courage and that has been trying different things and not being afraid when it seems not the way everyone does it. I remember one elderly aboriginal women Mabel who said something so simple but oh so brilliant. She lived in the aged care facility where we lived many years ago called Guwardi Ngadu; back when I was married and my then husband was manager. “Many paths, same Naboo.” Mabel said. Naboo was her language for God. Isn’t that amazing and she was so wise. For almost 40 years I did things only the ‘Christian’ way I was taught and raised in and I truly missed so much. But thankfully God is not ever restricted. He is everywhere. He cannot be boxed in. His Spirit is doing many new things and although it could possibly, like many things I do turn people away, I always filter things through my God lens and look for HIS heart and the Kingdom which is within. 🙂 He is the source of all things to me so I want to see Him in and through everything. The scripture I used in my art journal is this. Seeing God everywhere, in an through different ways has opened up my world considerably.